Breakfast, lunch, and dinner always seem to be the easiest meals to figure out. (With lunch tending to be the most the difficult to keep “healthy.”) But for most people, especially those in the working world, finding healthy snacks is oftentimes a frustrating challenge. Whether it’s the deceptively unhealthy “100-calorie” packs, or offices providing fuel that tastes greats and leaves you feeling like crap a few hours later, it’s not easy to find what your body needs…and enjoys. 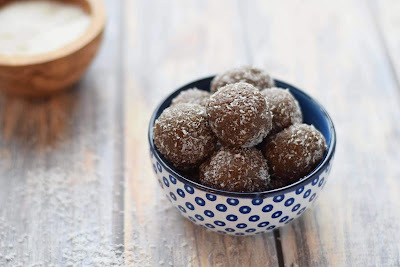 Enter protein almond balls. This no-bake recipe, created by Liv Langdon, can be made quickly at home, stores easily at work, tastes great, and fuels your body with the type of nutrition you want and need during the day. In a small bowl or plate, pour remaining coconut flakes and cinnamon. Set aside for dipping. Rub a little coconut oil in your palms to prevent the mixture from sticking to your hands when you roll into balls. Take 1/3 of the mix, and roll into ½ dollar sized balls. Then dip and roll into the coconut-cinnamon mixture. Place one whole almond on each protein ball. Place in freezer for 10 minutes before serving. Then eat. Makes 4 balls. Don’t Starve. Eat More Good Food. Healthy eating doesn't have to be that hard. At Born Fitness, we're working on a recipe guide for you. When it's ready, we'll send you 10 free recipes. Just leave your email, and the meals are all yours.